A powerflush is a cleaning procedure carried out by a trained member of our team. Power flushing your central heating system means cleaning the central heating water, the pipes, pump, radiators and the boiler, everything that the central heating water runs through. 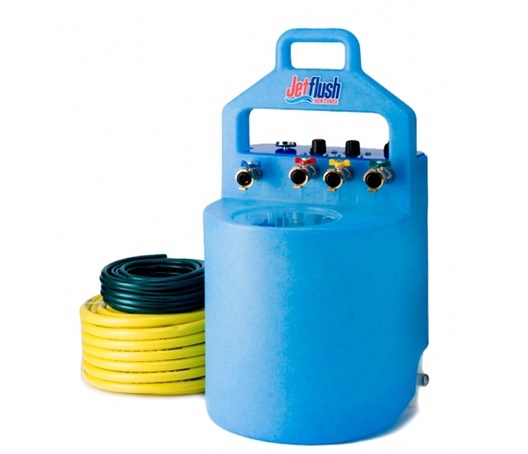 There is only one modern procedure worth undertaking – this is by connecting a power flushing machine to your systems circulating pump or a radiator and circulating the central heating water at high flow rates for hours and replacing dirty water with clean water. Using Sentinel X800 flushing chemicals will aid the cleaning process and once clean we will then add Sentinel X100 inhibitors, this chemical stays in the system and prevents the forming of sludge. Clean systems break down less as no sludge means no blockages, and less wear and tear on the parts that make up the system. Low levels of inhibitors can cause the radiator to rust and eventually start leaking, causing flood damage and repair bills. You will save money from not having breakdowns and increase of efficiency of your system.